Valid for all items (except those already reduced), starting at an order value of £60. Incl. VAT, plus shipping. Can only be redeemed once per person. May not be combined with other discounts. Valid for all items (except those already reduced), starting at an order value of £25. Incl. VAT, plus shipping. Can only be redeemed once per person. May not be combined with other discounts. New customers only: £15 for all products (except those already reduced), starting at an order value of £40. Incl. VAT, plus shipping. Can only be redeemed once per person. May not be combined with other discounts. Do not miss another myphotobook UK voucher! 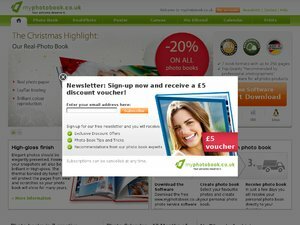 Simply leave your e-mail address and we'll always keep you informed of new vouchers for myphotobook UK. Special offer Xmas 2018: 25% from £55 on all photo books. Valid once per person. Incl. VAT, plus shipping. May not be combined with other discounts. Valid until 30/06/2018 for all items, starting at an order value of £75.Incl. VAT, plus shipping. May not be combined with other discounts. Can only be redeemed once per person. Back to school 2018: 30 % from £60 for all photo books and gifts for all customers. New customer offer: £5.99 instead of £8.99 Incl. VAT, plus shipping. May not be combined with other discounts. Valid on Two-colour Mugs, Panorama Mug, Magic Mug & Photo Mug metallic at extra cost. 30% from £60 on all photo books and all photo gifts- for all customers Incl. VAT, plus shipping. May not be combined with other discounts. Latest voucher code valid at a time of promo publication was entered to be working from 2019-01-01.